Thank you, Robert, for that kind introduction, and good morning, everyone. It's a pleasure to be with you this morning. On behalf of Secretary Pompeo, I'm honored to welcome you to the State Department. And on behalf of the United States Government, I'm delighted to open the 17th annual Sub-Saharan Africa Trade and Economic Cooperation Forum. Before I proceed, I'd like to recognize our distinguished guests this morning: First, Ms. Bernadette Legzim-Balouki, the minister of commerce and promotion of the private sector from the Togolese Republic; and Mr. Thomas Quartey, the deputy chairman of the African Union. We're delighted to have you with us today. Thank you for your presence. And of course, I'm also delighted to be here with my colleague, our distinguished United States Trade Representative, Ambassador Robert Lighthizer. And all of you, thank you, Your Excellencies, for being here today. I'm especially pleased to see so many leaders of trade in Africa assembled in one room to discuss progress under the African Growth and Opportunity Act to expand trade, investment, and economic growth across the continent. This is a vitally important topic and I know that President Trump shares my views on its significance. The administration places great importance on our relationship with Africa and sees genuine promise in the prospects for enhanced trade relationships with our partners. In the past few years alone, the G5 countries of the Sahel have done just that and we commend them for taking on greater responsibility for security. Africa is home to some of the fastest-growing economies in the world with expanding retail sectors and a record level of foreign investment. And the United States, as the largest economy in the world, sees boundless opportunities for Africa. It's in our mutual interest for markets to expand and we encourage candid discussions on this topic over the next two days. Africa is the major market of the future. Between today and 2050, roughly half of the world's population growth will occur in Africa, and that means a projected 1.2 billion new consumers will enter the African market. These trends, combined with Africa's growing youth population, will allow African countries to capitalize on a growing labor force. This great opportunity will come with challenges, however, including the need to provide jobs for this growing population. Expansion of trade and investment will be critical to meeting this challenge. This is why we are so committed to the Africa Growth and Opportunity Act, AGOA. It has already proven to be a key tool in our efforts to reinforce the United States trade and investment relationships with Sub-Saharan African countries. Enacted in May 2000, AGOA aims to expand U.S. trade with Sub-Saharan Africa, promote inclusive development and economic growth, foster a higher-level dialogue in trade and investment-related issues, encourage economic integration, and facilitate Sub-Saharan Africa's integration into the global economy. And it is clear that AGOA has produced results. Over the last year, total U.S. trade with Africa climbed up to $38.5 billion; that's up from 33 billion in 2016. And the total non-oil goods trade has more than doubled from 13 billion to almost 30 billion a year. This growth has benefitted both U.S. and African companies and contributed to economic opportunity and job creation on both sides of the Atlantic. To put this in practical terms let me outline some key examples of the mutual benefits and positive impact of AGOA. In West Africa, USAID has partnered with 20 U.S. firms to increase the competitiveness of Africa's growing shea industry, connecting 16 million African women to global markets while helping U.S. firms create jobs here at home. In Tanzania, we helped a pharmaceutical company secure financing for U.S. medical technology that strengthened healthcare services while generating employment both in Tanzania and the United States. And in Eastern, Western, and Southern Africa, AGOA supports the development of apparel industries that employ thousands of African workers. With AGOA's 20th anniversary on the horizon, we recognize that there is much more work to be done to expand the manifest benefits of this program and to develop a deeper trade and investment relationship with Africa. The United States is working to do our part to bolster trade and investment on the continent. USAID's regional trade and investment hubs are breaking down barriers for commerce every day. And you'll hear today from the Overseas Private Investment Corporation about new legislation that will reinforce development finance institutions in the United States. My colleagues at the Department of Commerce are engaged as well. 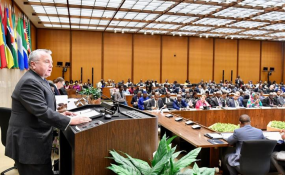 Recently, Commerce Secretary Ross led a mission of the President's Advisory Council on Doing Business in Africa to reinforce our commercial relationship with the continent. Representatives from these and other U.S. Government agencies are here today to share their experiences and to discuss opportunities to reinforce U.S. trade and investment with Africa. One of the best features of the AGOA Forum is the wide-ranging conversations from examining how to help women entrepreneurs develop agricultural exports to exploring energy investments. You'll also hear from outstanding participants in U.S. Government exchange programs that promote leadership and capacity building in entrepreneurship, business, and trade such as the African Women's Entrepreneurship Program, the Young African Leaders Initiative, and the International Visitors Leadership Program.